This Will Destroy You (abbreviated as TWDY) is an American post-rock band from San Marcos, Texas, formed in 2004. They typically compose lengthy atmospheric instrumental pieces, featuring layers of effects-laden guitar and a heavy usage of dynamics. Their fourth album Another Language, released in 2014, entered the Billboard Heatseekers Album Chart at number 7. This Will Destroy You was formed by guitarists Jeremy Galindo and Chris King, bassist Raymond Brown and drummer Andrew Miller in San Marcos, Texas, in 2005. [note 1] They had met through mutual friends, and played together in various different bands throughout high school before the lineup was finalized by around 2002. Early iterations of the band featured Galindo on vocals and "sounded like Radiohead", but after recording some tracks they decided the results were "awful" and didn't fit in with the rest of their music. After composing their next song "The World Is Our___", the band decided to write instrumental music instead. Chris King said in an interview with BBC Radio Foyle, "we were ... writing different kinds of songs and we wrote one [instrumental] song, and we were like, that works, let's go for it!" The band's name originated from a song that was to be called "This Will Destroy You", but this was rejected for being too pretentious. The band found it "hilarious." When asked whether he wished the band had chosen a different name, King said to Rock Sound, "It's supposed to be a little bit obnoxious. There's something about people automatically hating you before you play that's kind of endearing. It gets to the point where it's over-the-top obnoxious. It's an attention-grabber and people will check it out I guess. Even if they hate it." This Will Destroy You self-recorded and self-produced their first EP, Young Mountain, in 2005. They intended it to be just a demo, and sold it as a CD-R after their concerts. The release was reviewed by a number of critics and was generally praised. The band was contacted by Magic Bullet Records owner Brent Eyestone over the internet and he asked them to contribute a track to his label's It Came From The Hills Vol. 1 compilation. The band sent Eyestone a copy of their demo to thank him, after which he invited them to tour with Sparrows Swarm and Sing. This Will Destroy You then began to work with Magic Bullet on the basis of a verbal agreement; in keeping with the labels DIY attitude, no written contract was ever signed. In June 2006 Magic Bullet re-packaged and re-released Young Mountain. The band began to gather mentions in more publications, including Pitchfork Media and Rolling Stone. A Sputnikmusic review said, "TWDY's sound is near perfect. Production wise, everything is right where it should be. Tone wise, it doesn't get much better. The quiet parts are tear jerking. The loud parts, while equally tear jerking, are brutal." The EP came in for particular praise from Rock Sound, who called it "an astonishingly beautiful work that promises a bright future"; editor Darren Taylor named it as the best release of 2006. The writing process for This Will Destroy You, the band's eponymous debut studio album, was initially a slow and fragmented one. The band members were all living in different cities within Texas, due to work and school commitments, and so could only meet irregularly. Chris King said to Rock Sound, "[Writing] was a struggle; when we did meet up, sometimes the ideas would come flowing, but at others we'd just stand there for the whole time staring at each other." In February 2007 the band began recording with producer John Congleton at a studio in Texas owned by the country music singer Willie Nelson, a process that took several months. The band was booked to tour the United States during July and August, along with 65daysofstatic, Fear Before the March of Flames and Hot Cross. However, after one of their concerts guitarist Jeremy Galindo fell ill; he was later diagnosed in hospital as suffering from Crohn's disease, an inflammatory bowel condition. This led to the band having to cancel all their remaining summer tour dates. Combined with financial problems, this caused the band to go on a three-month hiatus, a time where the future of the band was uncertain. This Will Destroy You was released by Magic Bullet in January 2008. It was generally positively received: Rock Sound compared it to "the soundtrack to the impending apocalypse" and awarded it the fifth best album of the year, while Drowned in Sound called it "a true classic of its kind." Shortly after the release of the album, the band parted company with bass guitar player Raymond Brown, who left in order to focus on his medical career. The band auditioned a number of bassists, before permanently recruiting Donovan Jones. In March 2008 the band toured Europe for the first time, playing at the Bevrijdingspop, Out of the Crowd and Rhâââ Lovely festivals. The tour lasted for six weeks and included performances with Boris and Devil Sold His Soul. The song "The Mighty Rio Grande" from the band's self-titled release was featured in the trailer for, and the film, the Brad Pitt 2011 film Moneyball, in the 2014 film Earth to Echo, in the 2015 film Room and in the series Lethal Weapon. The foundations for what would become the Field Studies EP were formed in late 2007. This Will Destroy You and Lymbyc Systym were touring the United States together and decided to collaborate on a split record; the members of both bands were good friends and had further plans to tour again together in the future. They came together at John Congleton′s Texas studio in July 2008 to record their contributions; This Will Destroy You tracking two longer pieces to Lymbyc Systyms three shorter songs. In September Lymbyc Systym released Love Your Abuser Remixed, a remix album of their previous record Love Your Abuser. It featured a This Will Destroy You version of the title track, the band's first official remix. The band then set out on a series of tours, including an appearance at the ATP festival in April, playing alongside bands such as Devo and The Jesus Lizard. In July they played on the main stage at Rock Herk festival. In October of the same year the band performed at Damnation Festival, where they shared a stage with Jesu. In November the band parted company with Andrew Miller, due to musical differences between the members. They replaced him with Alex Bhore, their tour manager and former drummer for The New Frontiers. The band began working on their second studio album, to be called Tunnel Blanket, in late 2009. On April 1 the band posted a message on their Tumblr announcing that they had split. This was followed by a press release from their label, explaining the decision as being due to "uncertainty placed upon them by the behaviors and disappearances of other members." After it emerged that the whole incident was an April Fool's Day prank carried out by drummer Alex Bhore and Magic Bullet Records owner Brent Eyestone, Daniel Hopkins from the Dallas Observer named it as one of "the funniest april fool's day pranks in the local music scene." In May 2010 the band released an exclusive track titled "Their Celebrations" as part of PEACE, a compilation in aid of Amnesty International, after a request from the charity. The band subsequently released a two-song 12" EP titled Moving on the Edges of Things in August 2010, before embarking on a September US tour, supporting the metal group Deftones. This was followed by a September and October European tour, including a performance at the Incubate festival. A 7" single, Communal Blood, was released in December of the same year. This was the band's first single and featured two tracks from Tunnel Blanket. This has been recorded and mixed by John Congleton, and is set for release in Europe on May 9, 2011 on Monotreme Records, and on May 10 on Suicide Squeeze Records for the rest of the world with exception of Australia / New Zealand, as released by Hobbledehoy Record Co.. The band is set to tour Europe in June and July to promote the record, which will include an appearance at Dour Festival in Belgium. In March 2013, This Will Destroy You performed their first ever Australian tour, supported by Perth act Tangled Thoughts of Leaving. In October 2013, the band released a live album, titled Live in Reykjavik, Iceland. During their performance at the Crescent Ballroom in Phoenix, Arizona on March 12, 2014, the group stated that they would release an album by the end of the year. On June 23, 2014 Suicide Squeeze announced This Will Destroy You's third studio album, Another Language, which was released September 16, 2014. The single from the album, Dustism, was released on their blog on June 25. The band toured Australia, New Zealand and Asia in May–June 2015. They subsequently announced that they will be going on tour with Deafheaven and Emma Ruth Rundle in early 2017. The band announced on their Instagram that they are working on their fourth studio album, New Others Part One, which was released September 28, 2018. "New Others Part Two" was released on October 16, 2018 after the band had teased the release of new music just hours beforehand. The band's compositions typically feature a wide dynamic range, with slow build-ups to a "wall of noise" crescendo. The guitars are usually the most prominent feature of the band's sound, combining ambient soundscapes with simple melodies, and using a number of effects, such as reverb, sustain and distortion. Many reviews categorized the band's early releases as post-rock, and compared them to other bands of the genre, most notably fellow Texas instrumental group Explosions in the Sky, although the band members largely reject this description. In an interview with the Dallas Observer in 2009, Jeremy Galindo said, "It can be aggravating. I think after this new album comes out, a lot of that is gonna stop. Because this next album is definitely gonna be sounding more like the stuff that we do listen to." The band describe their new sound as being darker and heavier, referring to it as "doomgaze", a portmanteau of doom metal and shoegaze. Jeremy Galindo, along with Magic Bullet Records' Brent Eyestone, runs an independent film studio called We Tried Film. Their first production is set for release in summer 2012. ^ There is some ambiguity as to their exact year of formation as sources have reported various years between 2002 and 2005. The latter is, however, the most-often reported year. 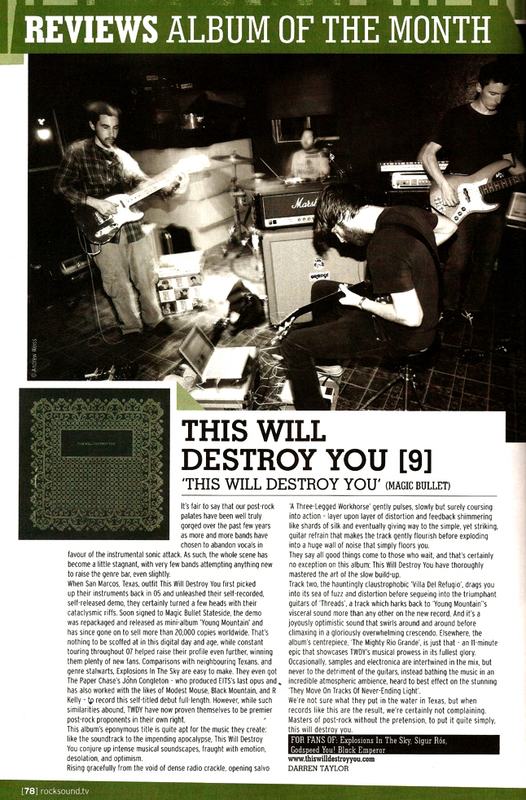 ^ "This Will Destroy You: Chart History". Billboard. Rovi Corporation. Retrieved May 25, 2011. ^ a b Stevens, Darcie (March 14, 2008). "SXSW Platters: This Will Destroy You". The Austin Chronicle. Austin Chronicle Corp. Archived from the original on April 13, 2011. ^ True, Chris. "This Will Destroy You Biography". Allmusic. Rovi Corporation. Retrieved April 13, 2011. ^ a b Rayfield, Angie (March 15, 2010). "This Will Destroy You Interview SXSW 2010". Spinner. AOL. Archived from the original on April 13, 2011. ^ a b Hidden, Chris (July 2011). "Words Are Not Enough: This Will Destroy You". Rock Sound (149): 76. ISSN 1465-0185. ^ "On the Road: This Will Destroy You". Rock Sound (108): 123. April 2008. ISSN 1465-0185. Archived from the original (JPEG) on April 13, 2011. ^ a b c d e f Taylor, Darren (January 2008). "Reviews: Album of the Month. This Will Destroy You: This Will Destroy You". Rock Sound (105): 79. ISSN 1465-0185. Archived from the original (JPEG) on April 13, 2011. ^ Anderson, Stewart (November 2006). "This Will Destroy You: Young Mountain" (PDF). The New Scheme (15): 41. Archived from the original (PDF) on April 13, 2011. ^ a b Diver, Mike (April 14, 2008). "Discover This Will Destroy You". Drowned in Sound. Archived from the original on April 13, 2011. ^ Anderson, Stewart (May 2008). "This Will Destroy You" (PDF). The New Scheme (18): 14. Archived from the original (PDF) on April 13, 2011. ^ a b Hale, Trevor (February 29, 2008). "This Will Destroy You to Lay Waste to Kilby Court". Daily Utah Chronicle. Archived from the original on April 13, 2011. ^ "This Will Destroy You: Young Mountain" (Press release). Magic Bullet. Archived from the original on April 13, 2011. ^ Byrom, Cory D (August 23, 2006). "This Will Destroy You: Young Mountain". Pitchfork Media. Retrieved February 2, 2011. ^ The Katz Brothers (November 11, 2006). "This Will Destroy You: Young Mountain". Sputnikmusic. Archived from the original on April 13, 2011. ^ Marshall, Joe (June 2006). "This Will Destroy You: Young Mountain". Rock Sound (85): 87. ISSN 1465-0185. Indeed this is music that transcends such cynicism, and from the glistening vapour trails of delay that criss-cross 'I Believe in Your Victory'... This Will Destroy You have created an astonishingly beautiful work that promises a bright future. ^ Taylor, Darren (January 2007). "Top 75 Albums of 2006". Rock Sound (92): 24. ISSN 1465-0185. ^ a b c d e f g Hidden, Chris (February 2008). "This Will Destroy You: Rebuilding A Band". Rock Sound (106): 76–77. ISSN 1465-0185. Archived from the original (JPEG) on April 13, 2011. ^ Shultz, Brian (April 28, 2007). "Tours: Fear Before the March of Flames / Hot Cross / 65daysofstatic (U.S.); Europe tour". Punknews.org. Archived from the original on April 15, 2011. ^ "This Will Destroy You Forced to Cancel Tour (& Other News)". Magic Bullet. Archived from the original on April 15, 2011. ^ "This Will Destroy You - This Will Destroy You". Allmusic. Rovi Corporation. Retrieved April 15, 2011. ^ "Top 75 Albums of 2008". Rock Sound (117): 29. 2008. Archived from the original (JPEG) on April 15, 2011. ^ a b Diver, Mike (March 27, 2008). "This Will Destroy You: This Will Destroy You". Drowned in Sound. Archived from the original on April 15, 2011. ^ "This Will Destroy You". Magic Bullet. Archived from the original on April 15, 2011. ^ a b "This Will Destroy You Gear Up For First Ever European Tour". Magic Bullet. Archived from the original on April 15, 2011. ^ "5 May 2008 - Bevrijdingspop 2008". djguide.nl (in Dutch). Archived from the original on April 15, 2011. ^ "Out of the Crowd Festival: Highlights". kulturfabrik.lu (in German). Archived from the original on April 15, 2011. ^ "Archives 2008: Music". Rhâââ Lovely Festival. Archived from the original on April 15, 2011. ^ a b Marshall, Joe (2008). "This Will Destroy You / Lymbyc Systym: 'Field Studies'". Rock Sound (117): 86. ISSN 1465-0185. Archived from the original (JPEG) on April 19, 2011. ^ a b Sannicandro, Joseph (November 9, 2008). "This Will Destroy You & Lymbyc Systym: Field Studies". thesilentballet.com. Archived from the original on April 15, 2011. ^ Powell, Austin (March 14, 2008). "Lymbyc Systym: Love Your Abuser Remixed". The Austin Chronicle. Austin Chronicle Corp. Archived from the original on April 19, 2011. ^ "Field Studies - This Will Destroy You". Allmusic. Rovi Corporation. Retrieved April 15, 2011. ^ Lukowski, Andrzej (May 13, 2009). "ATP vs The Fans Part II: the DiS Review". Drowned in Sound. Archived from the original on April 19, 2011. ^ "This Will Destroy You Vervangt The Rascals op Rock Herk 2009" [This Will Destroy You Replace The Rascals at Rock Herk 2009]. LiveXS (in Dutch). July 8, 2009. Archived from the original on April 19, 2011. ^ "Jesu to Headline Rock Sound Stage at Damnation". Rock Sound. July 9, 2009. Archived from the original on April 25, 2011. ^ a b c Shultz, Brian (June 16, 2010). "Interviews: This Will Destroy You". Punknews.org. Archived from the original on April 25, 2011. ^ a b c d "Your New Favorite Band: This Will Destroy You". thedumbingofamerica.net. May 19, 2010. Archived from the original on April 25, 2011. ^ Murphy, Tom (May 25, 2011). "Donovan Jones of This Will Destroy You on the State of Post-rock and Why He Resists the Term". Westword. Archived from the original on May 26, 2011. ^ Freedman, Pete (February 16, 2011). "Neon Indian Guitarist Ronnie Gierhart Leaves Band, Starts New Ronnie Heart Project". Dallas Observer. Retrieved March 17, 2011. ^ a b Smith, Roz (May 31, 2011). "Interview with Jeremy Galindo from This Will Destroy You: Let The Magic Flow". The Aquarian Weekly. Arts Weekly. Archived from the original on June 6, 2011. ^ "This Will Destroy You R.I.P. (Literally)". Magic Bullet. April 1, 2011. Retrieved June 6, 2011. ^ Hopkins, Daniel (April 1, 2011). "The Funniest April Fools' Day Pranks in the Local Music Scene". Dallas Observer. Archived from the original on June 6, 2011. ^ "PEACE: Release Delay". buffetlibredjs.net. April 12, 2010. Archived from the original on April 25, 2011. ^ Morgan, Dan (August 15, 2010). "This Will Destroy You: Moving on the Edges of Things". Rock Sound (139): 98. ISSN 1465-0185. Archived from the original on April 25, 2011. ^ Hopkins, Daniel (July 6, 2010). "This Will Destroy You to Tour with Deftones". Dallas Observer. Archived from the original on April 25, 2011. ^ Djaferis, Alex (August 22, 2010). "Only in Europe Will This Destroy You". AbsolutePunk. Buzz Media. Archived from the original on April 25, 2011. ^ Paul, Aubin (June 16, 2010). "Media: This Will Destroy You: Communal Blood". Punknews.org. Archived from the original on April 25, 2011. ^ "This Will Destroy You Finally Announce Album Release". Rock Sound. February 23, 2011. Archived from the original on April 25, 2011. ^ Paul, Aubin (February 23, 2011). "This Will Destroy You to Release 'Tunnel Blanket' in May". Punknews.org. Archived from the original on April 25, 2011. ^ "Monotreme Records Welcomes This Will Destroy You". Monotreme. February 22, 2011. Archived from the original on April 27, 2011. ^ "Mogwai et The Drums au Festival de Dour" [Mogwai and The Drums for Dour festival]. 7sur7.be (in French). De Persgroep. March 9, 2011. Archived from the original on April 27, 2011. ^ "Suicide Squeeze Records". June 23, 2014. Retrieved September 15, 2014. ^ "THIS WILL DESTROY YOU". June 25, 2014. ^ "Deafheaven announce 2017 US headlining tour". Consequence of Sound. November 28, 2016. Retrieved November 29, 2016. ^ a b Grubbs, Eric (September 3, 2009). "This Will Destroy You Sets Out to Make a Name for Itself in One Way or Another". Dallas Observer. Archived from the original on April 13, 2011. ^ a b Solomon, Blake (January 30, 2008). "This Will Destroy You: This Will Destroy You". AbsolutePunk. Buzz Media. Archived from the original on April 27, 2011. ^ Volz, Jordan (January 25, 2008). "This Will Destroy You: This Will Destroy You". thesilentballet.com. Archived from the original on April 15, 2011. ^ Volz, Jordan (2006). "The Top 50 Instrumental Releases of 2005". thesilentballet.com. Archived from the original on April 13, 2011. ^ Williamson, Aidan (November 30, 2007). "This Will Destroy You: S/T". strangeglue.com. Archived from the original on April 27, 2011. ^ Ali, Reyan (August 24, 2010). "Major Labels: This Will Destroy You Rally Against Post-rock". The Boston Phoenix. Phoenix Media/Communications Group. Archived from the original on April 27, 2011. ^ Marin, Francisco (October 4, 2010). "Band Lights Up Austin Underground. Music Monday: Amasa Gana". The Daily Texan. Texas Student Media. Archived from the original on April 27, 2011. ^ Sciortino, Karley (March 2010). "Always Check the Label: Light Lodge". Dazed and Confused. Waddell. ISSN 0961-9704. Archived from the original on April 25, 2011. ^ Long, Jonathan (April 2007). "Aughra & Mosh Patrol: Is There Anyone Else Outside?". Rock Sound (95): 98. ISSN 1465-0185. Under their respective monikers, both are able to explore musical avenues not afforded with their main bands, delving into the murky depths of ambient electronica. ^ Anchors (March 6, 2007). "Aughra / Mosh Patrol: Is There Anyone Else Outside?". Punknews.org. Archived from the original on April 27, 2011. ^ "World War Z (2013)". IMDb. Retrieved October 22, 2014. McCauley, Stephen; This Will Destroy You (April 24, 2008). Electric Mainline: This Will Destroy You (RAM) (Podcast). Dublin: BBC Radio Foyle. Retrieved May 3, 2011. Texaští This Will Destroy You se Vrací do Prahy [Texans This Will Destroy You Return to Prague]. Radio Wave (in Czech). Český Rozhlas. July 14, 2009. Archived from the original (Podcast) on April 13, 2011. Pastorek, Whitney; Galindo, Jeremy; King, Chris (May 21, 2009). This Will Destroy You: Studio SX 2009 Interview (Video). Austin, Texas: Studio SX. Retrieved May 3, 2011. This Will Destroy You Interview. Current TV. Current Media. June 27, 2010. Archived from the original on April 13, 2011. This page was last edited on 21 February 2019, at 16:50 (UTC).